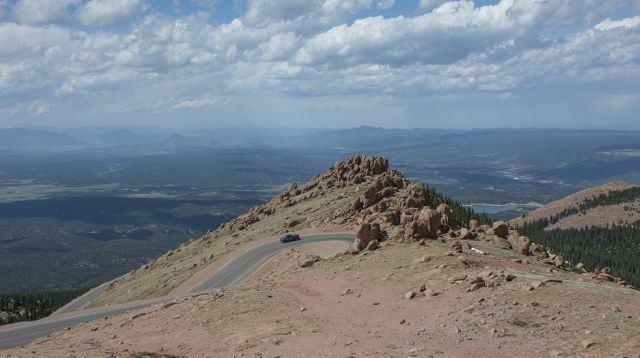 So, today we decided to ‘do’ Pikes Peak. 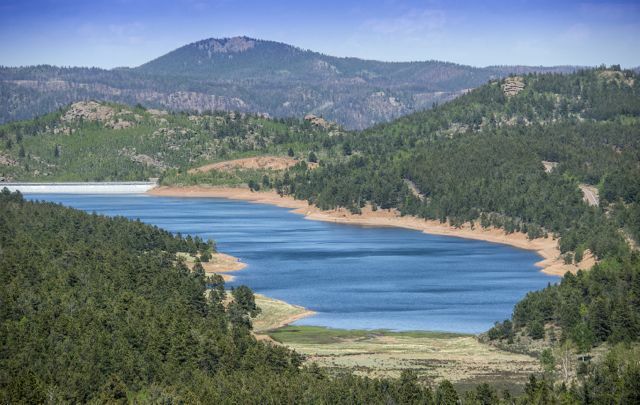 We set off in what we thought was the right direction, heading north out of Colorado Springs and quickly realised we were going in the wrong direction! I have to say that it wasn’t Margaret’s fault this time because we hadn’t plugged her in. It was human error. But, all was not lost because when we realised our mistake we were going to turn around when we noticed we were at a place called Briargate and Si suddenly realised that we wanted to go there anyway because we wanted to visit the Apple store that was located there. We needed to buy another portable drive because the one we’d brought with us to back-up the laptop has thrown a wobbly and won’t work! Amazon, expect an email from me when we return! 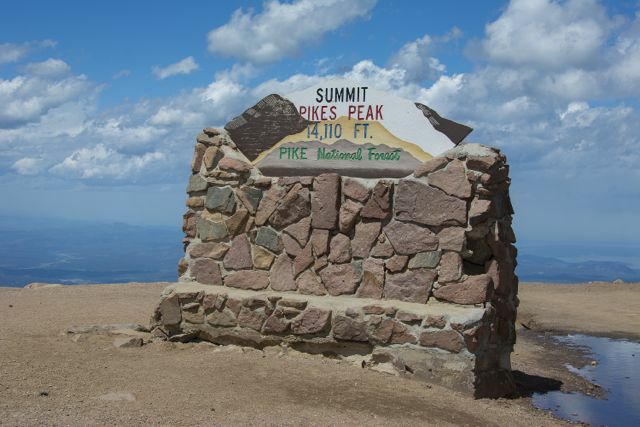 We headed back south and soon found Pikes Peak Highway. 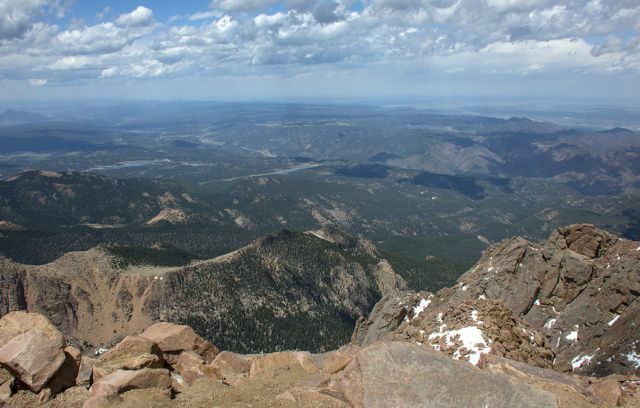 Pikes Peak is known as America’s Mountain. 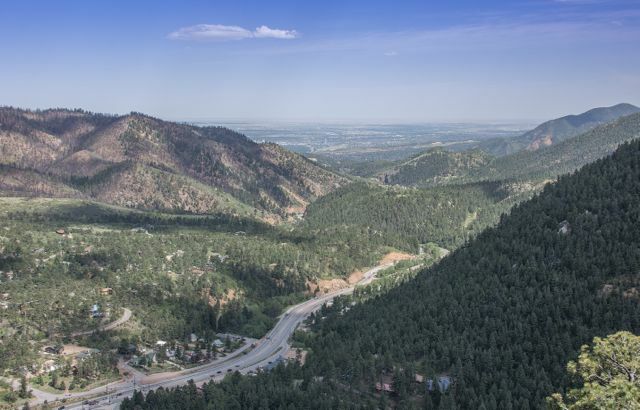 The Highway is 19 miles long, is a two-lane road ascending more than 6,000 feet in elevation to 14,115 and we were going to drive it. The Ranger said the 19 miles would take us one hour to drive. 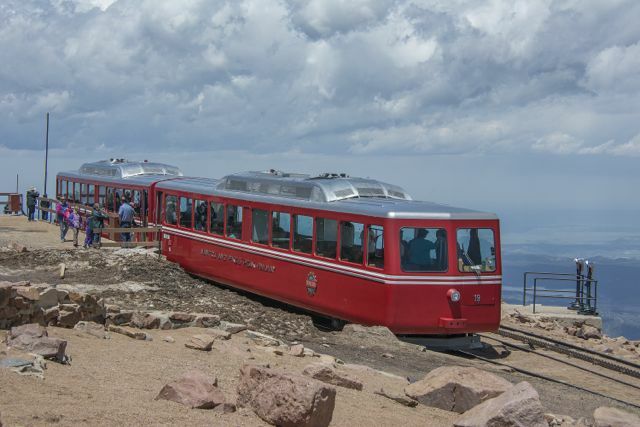 Some people travel to the summit by cog railway. 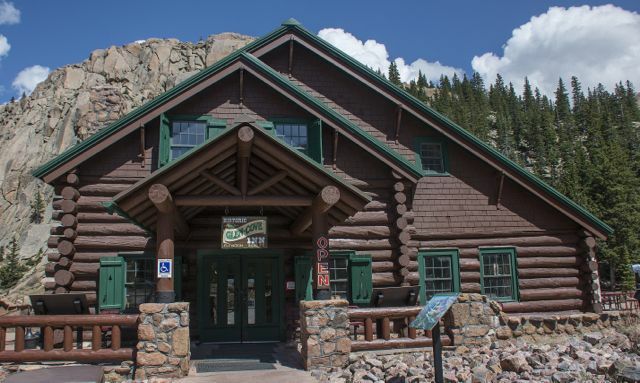 It was first built in 1891 and runs continually today. Well, goodness me, it was one hairy drive. 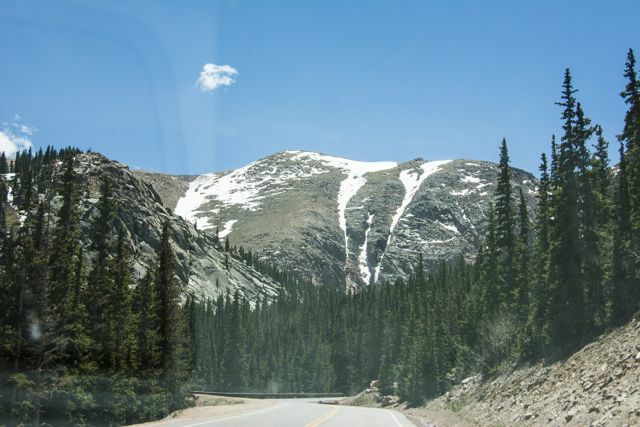 I thought the Trail Ridge Road was scary, this was much, much worse. There were sheer drops round hairpin bends, it was like being on a switchback! I dread to think what my blood pressure reading must have been. Si was okay because he was on the ‘safe’ side. At times I just couldn’t look over the edge and was holding on to the car door handle for dear life. Some of the drop offs are 1,000 feet down! We were told to turn off the air-conditioning going up and when driving back down to use low gear. The views of course were stunning. We were way above the tree line and as we turned each corner and looked up you could see the cars above just getting higher and higher. Half way up the road we stopped to change into jeans as we were told it would be really cold at the summit but when we got there it wasn’t too bad even though there was some snow and we didn’t need thick jackets. Can you imagine racing up this road to the summit. Well, daring drivers have been doing just that since the first race in 1916. The race continues today. Mining magnet Spencer Penrose arranged the race to advertise his new mountain auto highway. The first winner, Rea Lentz, sped to the summit in just 20 minutes and 55.6 seconds. Can you imagine driving at speed on a dirt road. It was only fully paved in 2011! The hill climb is the second oldest race in the US behind only the Indianapolis 500. At the summit is a memorial dedicated o Katherine Lee Bates (August 12th 1859 to March 28th 1929). 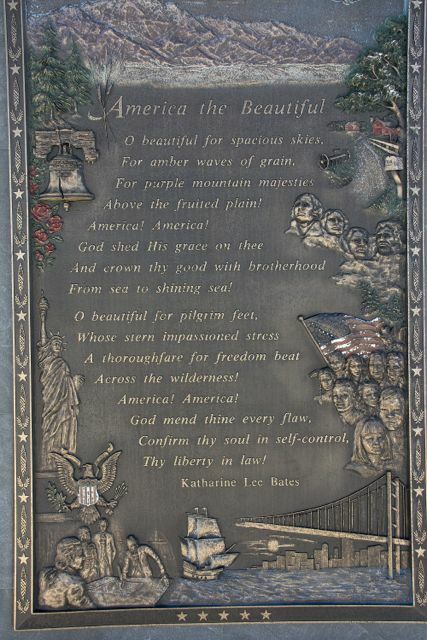 She was an American songwriter and was the author of the words to the anthem ‘America the Beautiful’. About half-way up stands the Historic Glen-Cove Inn built in the late teens early 1920s. It has always been somewhere for travellers to stop and refresh themselves. On the way back down there is a compulsory brake check by a ranger. This is because if the breaks overheat they will stop working and no-one wants to be without breaks at this height. Our’s measured 8% so we were given a ‘well done’ because Si was driving down correctly. Well done Si! It suddenly occurred to me that I’ve taken a couple of photos of Si at dinner but have forgotten to post them. So this is me righting a wrong! I decided to have a nice healthy salad …………. this one would last me a week! Sand with her healthy salad! 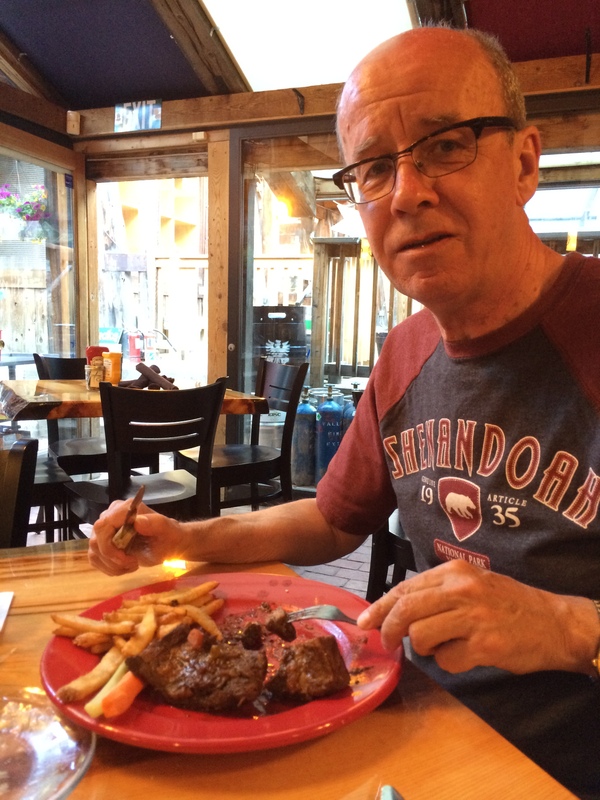 Si with his short ribs! 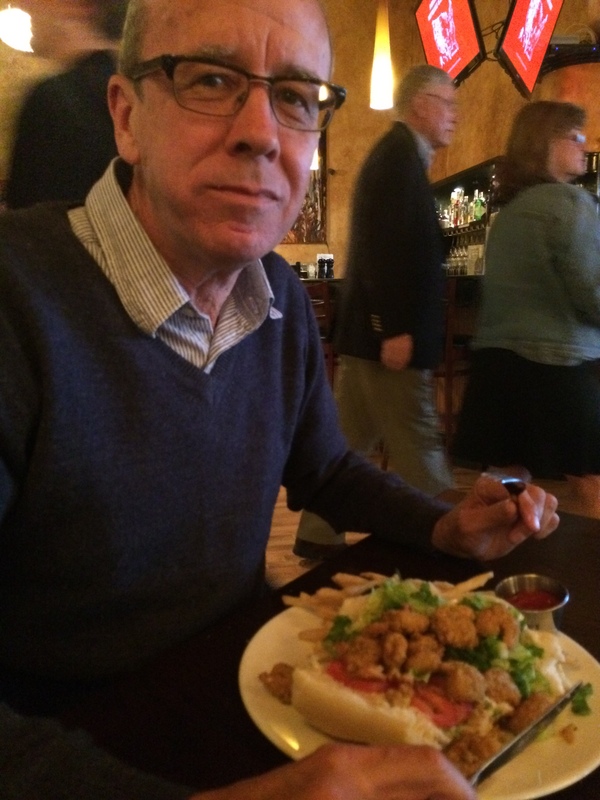 Si with his Po’ Boy shrimp sandwich! 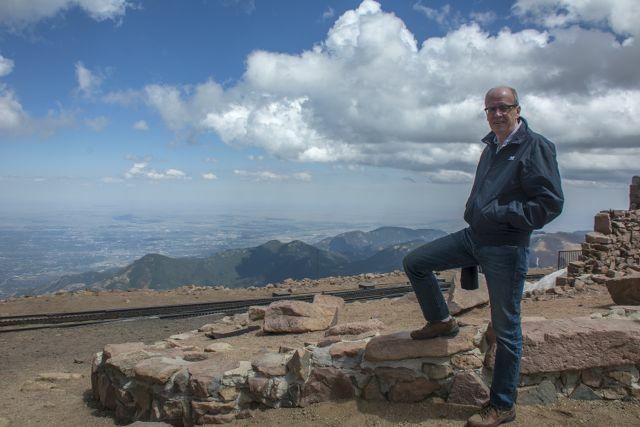 Not sure what is dangling between Simons legs at Pikes Peak summit but I’m sure at that altitude they can’t touch you for it! Just take care not to run too quickly because it could be rather painful! All that brake testing makes you wonder what disasters have happened historically, you don’t do all that lark for no good reason. I must say the cog railway looked very inviting. Great stuff folks, travel safe. Thanks Malcolm. Proof that I will never be a good photographer. I didn’t notice his extra lens dangling there!!! 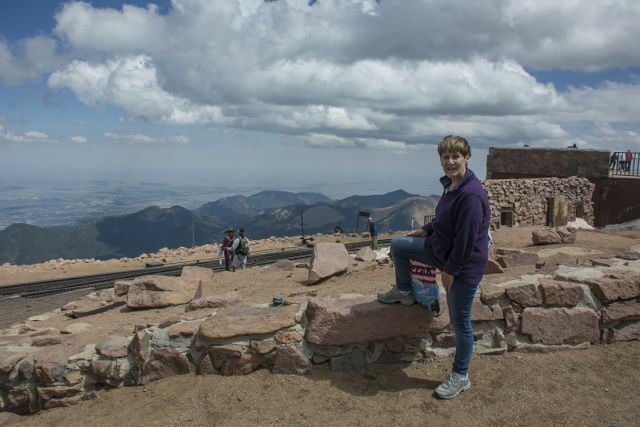 My pastor at my church biked up Pikes Peak! Crazy people! 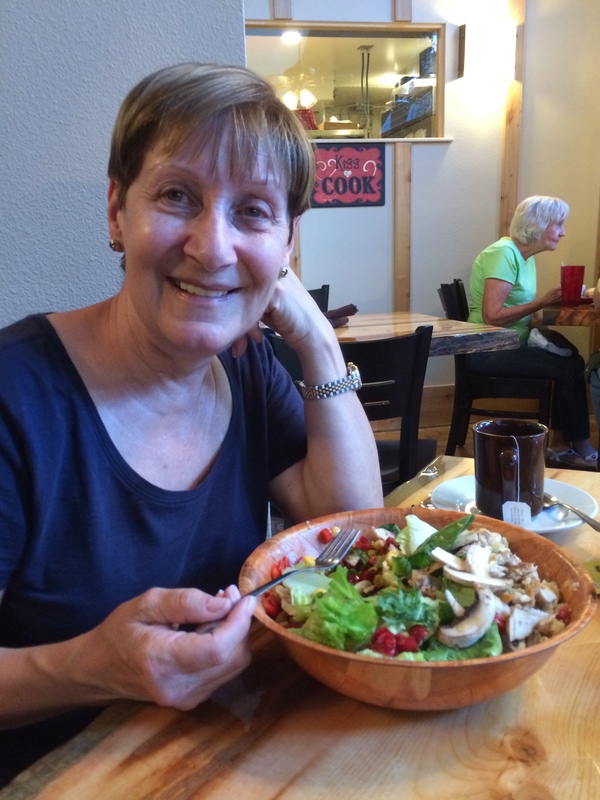 I’m glad you had a nice healthy salad one day…and now we have proof! Po’ Boys are yummy! good choice Si! !